Approaching his centenary, historian and Princeton professor Bernard Lewis remains one of the world’s foremost scholars of the Middle East and its history from antiquity to the present; he is the author of dozens of books on the region, covering its culture, its history and its conflicts, and his advice and insight has been sought by politicians and policymakers alike. His The Middle East: A Brief History Of The Last 2,000 Years, as its subtitle suggests, undertakes the difficult task of condensing two millennia of history into a single volume, which obviously necessitates a great deal of summary and excision, but I was drawn to it both as an introductory text for someone with only a passing familiarity with the region and for the fact that it was published in 1996, prior to the events of September 11th, 2001, that have forced the world to take interest in an otherwise neglected region of the globe. It would be a disservice to reduce the entire history of the Middle East to nothing more than a path to that fateful day, but nor can any present reader avoid noticing some of the historical developments that seemed to incline towards it. Praise be to God, who begets no son, and has no partner in [his] dominion: nor [needs] he any to protect him from humiliation: yes, magnify him for his greatness and glory! The meaning of all this is at once political and religious. Only religion can justify empire. Only empire can sustain religion. Through his apostle Muhammad and his viceregent the caliph, God has given a new dispensation and a new order to the world. In this first great religious structure dedicated to the new faith, its worldly head, the caliph Abd al-Malik, asserted Islam’s connection with the precursor religions, and at the same time made clear that the new dispensation had come to correct their errors and to supersede them. He will go on to develop this connection between religion and empire for the first half of the book, up until the moment that the Islamic world finds itself increasingly on the losing side in its battles against the Christian powers. At this point, when a crisis of faith is forced upon the region by the overwhelming military might of their rivals, Lewis divides his focus into chapters, or “Cross-Sections,” on the state, the economy, the culture and the ruling elite, breaking with the chronological narrative to better cover each of his subtopics. One aspect of Muslim culture I would like to touch on, not least because of its continued relevance, is the status of other religions within Islam. Though, in theory, the existence of stubborn Christian and Jewish worshippers should represent an affront to the truths of Islam, these infidels can aspire to the status of a dhimmi, or “tolerated unbeliever,” which confers on them basic rights and freedoms, including freedom of worship and protection of life & property, provided they accept a subordinate social status and a special tax, known as the jizya. Today, with our secular notion of a separation between church and state, this practice seems barbaric, but Lewis is careful to point out that, at its inception, it constituted nothing less than a revolution in tolerance, and helped increase the prosperity of Muslim society, first by attracting talented Jewish and pagan merchants fleeing persecution in Christian lands, and second by incentivizing a conversion to Islam. For the Prophet and his companions, […] the choice between God and Caesar, that snare in which not Christ but so many Christians were to be entangled, did not arise. In Muslim teaching and experience, there was no Caesar. God was the head of the state, and Muhammad his Prophet taught and ruled on his behalf. As supreme sovereign of the religio-political community of Islam, he was succeeded by a long line of caliphs. Unlike within Christianity, where lines like “Render unto Caesar the things that are Caesar’s, and unto God the things that are God’s” were interpreted to allow for two hierarchies, imperium and sacerdotium, dealing with the practical and the sacred respectively, Islam permits no distinction. The caliph is empowered “neither to expound nor to interpret the faith, but to uphold and to protect it.” To accomplish this, “he had to maintain the God-given Holy Law within the frontiers of the Islamic state, and to defend and, where possible, extend those frontiers, until in the fullness of time the whole world was opened to the light of Islam. In Muslim historiography, the early conquests are designated by an Arabic word, futūh, literally, ‘openings. '” In practice, of course, those seeking power and those able to wield it are not always beholden to holy scripture, and the Middle East would prove every bit as vulnerable to military uprisings as Europe. 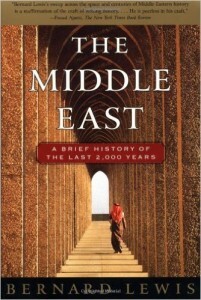 The Middle East was published in 1996, when Lewis could justifiably argue that the West was prepared to play only a passive role in the region. Subsequent events, up to and including the recent waves of migration into Europe (legal and illegal), have made this passivity untenable and an understanding of the region, its history and culture, invaluable. The introduction Lewis provides is both sweeping and thorough, and worthwhile not only for the questions it answers but for the questions it raises.